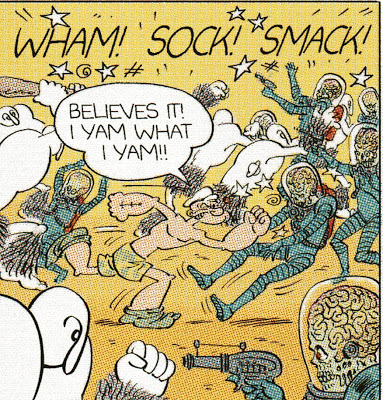 Another Rave Review for MARS ATTACKS POPEYE --a month after its release!! 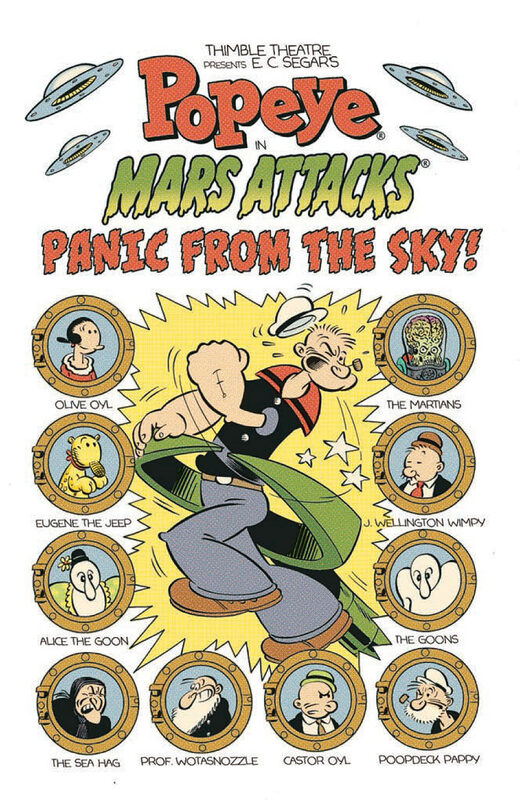 "Mars Attacks Popeye is so freaking brilliant..."
Four weeks after its debut and the 5 Star Reviews keep coming! "Martin Powell’s dialogue is spot-on, even for old time Popeye fans, and Terry Beatty has the look down pat and is equal to the excellent script. What a joy to read this was!" "I gotta kick outta it!" 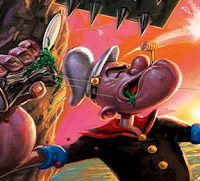 "All the Popeye lore is here. It's brilliant!" 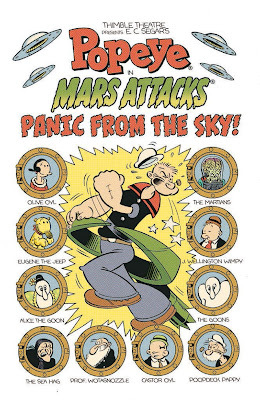 MARS ATTACKS POPEYE is affectionately dedicated to super Popeye fan, the one and only Bob Burns, who is recovering from recent heart surgery. Eat your spinach, Uncle Bob, and get well soon! "It's awesome! Seriously, my hat is off to Martin Powell (writer) and Terry Beatty (art) for completely capturing the feel and look of Popeye in what has to be my favorite mashup since Archie met the Punisher. Highly recommended." "This was as close as you'll ever find to a perfect comic book. 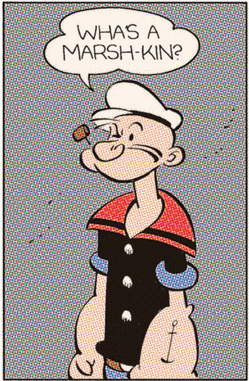 Martin Powell does a wonderful job of making Popeye talk like he always has. Terry Beatty demonstrates his adaptability as a cartoonist by depicting Popeye and cast perfectly, making them look like they'd just walked out of one of EC Segar's classic comic strips." Another warm heart-felt thank you to everyone who has supported MARS ATTACKS POPEYE which, by most indications, seems to have sold-out for a second week in a row!! As J. Wellington Wimpy would say, "Thank you, thank you too much!" Yup, saw 'em myself! 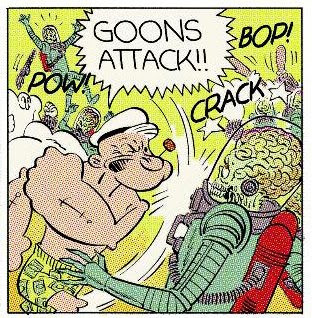 The re-orders of MARS ATTACKS POPEYE have arrived in the comic shops! Get 'em before they're gone!! 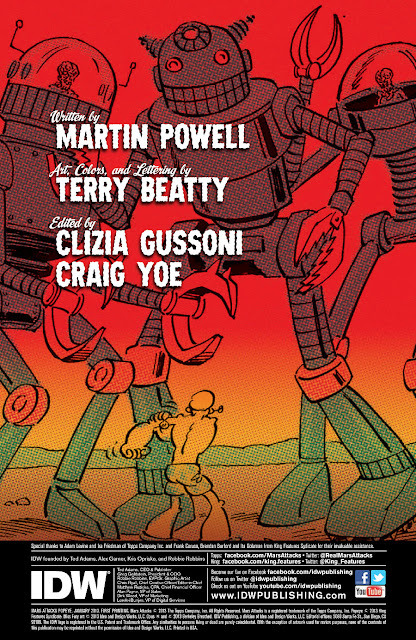 "The effort of writer Martin Powell and artist Terry Beatty is one funny, clever and well-produced comic book...solidly amusing and entertaining." 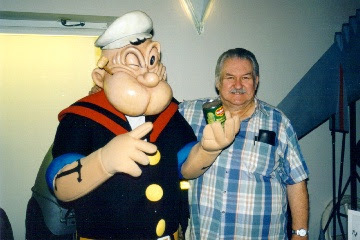 "Martin Powell remained true to the wondrous innocence of the bygone age of the 'funny books'...I felt like a kid again, just laughing at Popeye's silly speech patterns....Of course, artist Terry Beatty's artwork helped bring me back into the past as well. The attention to detail of the characters was spot on." Another new rave review for MARS ATTACKS POPEYE!! "Kudos to writer Martin Powell and artist Terry Beatty for their fantastic work, recapturing the timeless allure of Thimble Theatre." Another great new five-star review for MARS ATTACKS POPEYE!! "Martin Powell's dialogue, especially the running gags, are spot on, and delivered with such perfect timing it makes me wonder if the regular Popeye books are this much fun....Terry Beatty's characters look so crisp and energetic that when you’re reading you can’t help but hear Popeye’s voice." 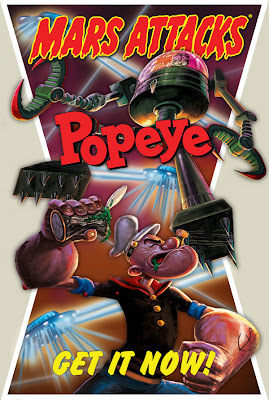 Yet another great new review for MARS ATTACKS POPEYE!! 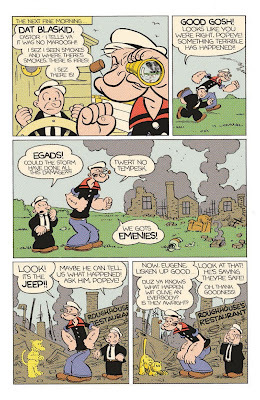 "Martin Powell has captured everything that makes Popeye great...coupled with Terry Beatty’s art and lettering, which has really captured the spirit of the original E.C. 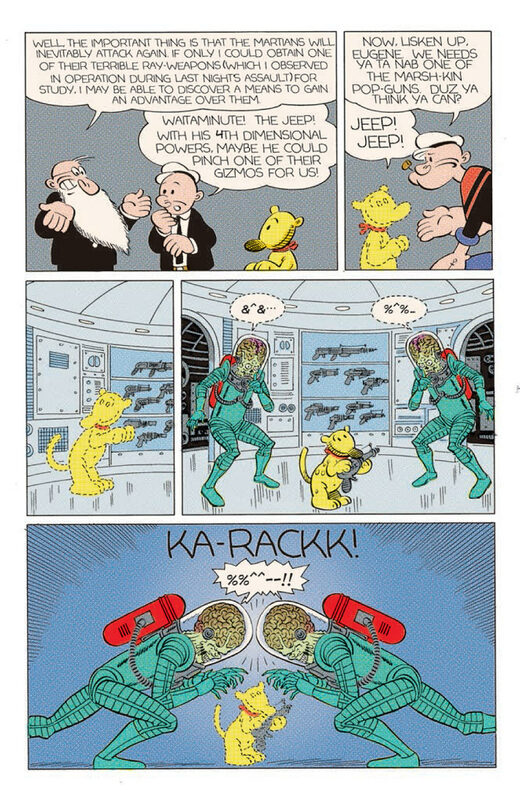 Segar comics." "This is one great issue you can read and enjoy on its own. Highly recommended." 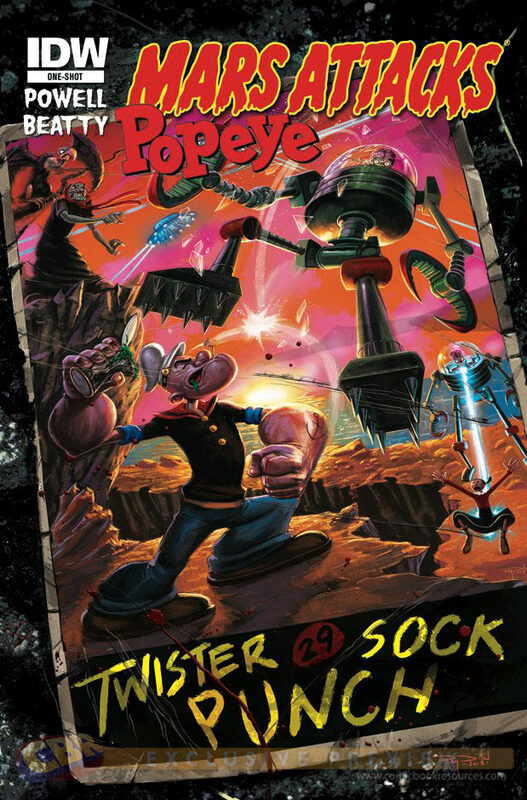 Yet Another Awesome Review for MARS ATTACKS POPEYE!! "This comic was a fun, enjoyable read with a nice touch of humor thrown in." "The storytelling also lives up to your expectations. It is both curious and original...funny and well-crafted." "A good story, some great dialogue and genuinely funny lines, boundless nostalgic appeal, but an exciting comic even for anyone unfamiliar with the franchises. This is a FUN comic book." I remember literally trembling with excitement as I wrote this page -- depicting the first appearance of the feisty sailor in MARS ATTACKS POPEYE. 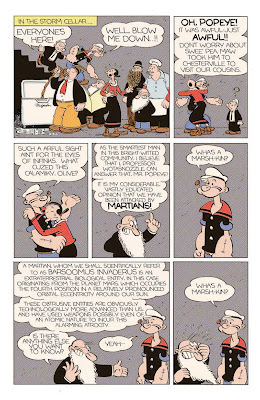 It was the realization of a life-long dream of writing for Popeye, my favorite character since before I can even remember. 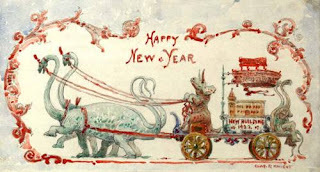 Once I saw Terry Beatty's fabulous art on the page I nearly swooned. Don't listen to anyone who says that dreams don't come true. I'm living proof that they do. Have a listen -- but beware of Spoilers! "...where else was I gonna find Popeye, in his skivvies, with an army of goons fighting off an attack of Martians?? Really fun story, great fights..."
"Martin Powell sticks close to the gentle and oddly melancholy tone of the original E.C. 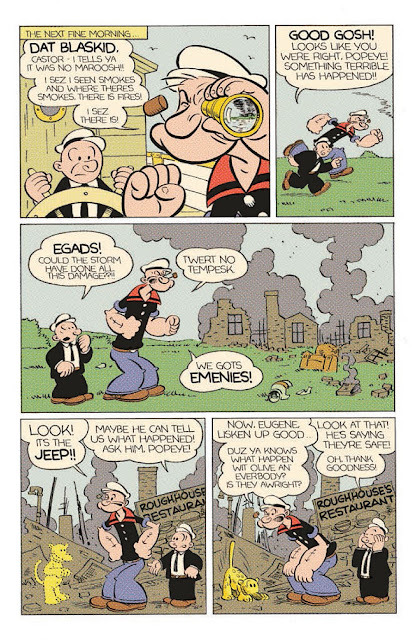 Segar strips...Terry Beatty, meanwhile, does a pretty stunning Segar impersonation as he handles all the art chores." Better grab your copy now! "Martin Powell crafts a Popeye story that feels absolutely classic...the art is equally fantastic. Terry Beatty does an amazing job." Drawn by Terry Beatty. Written by Martin Powell. Created by E.C. 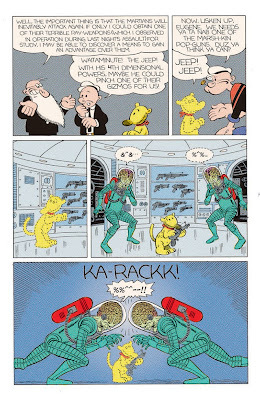 Segar. COMING TOMORROW...The Epic Adventure of the Year!! On this Wednesday, January 2nd, these Marsh-kins are gonna be mighty sorry! I sez they is! Illustrated by Terry Beatty and written by Martin Powell. Cover by Ray Dillion. 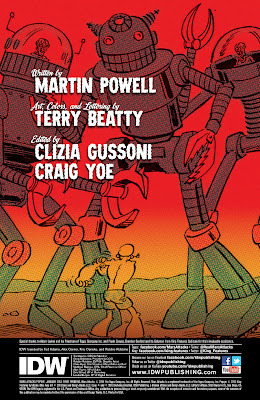 On Sale January 2, 2013 from the fine folks at IDW. Well, so long 2012. In the old is-the-glass-half-empty-or-half-full question, I’ve always realistically answered, "It’s both.” While this was a lousy, even tragic year in many ways there were certain wonderful moments started which I hope will go on forever. All in all, through good times and bad, I’m a very lucky guy.